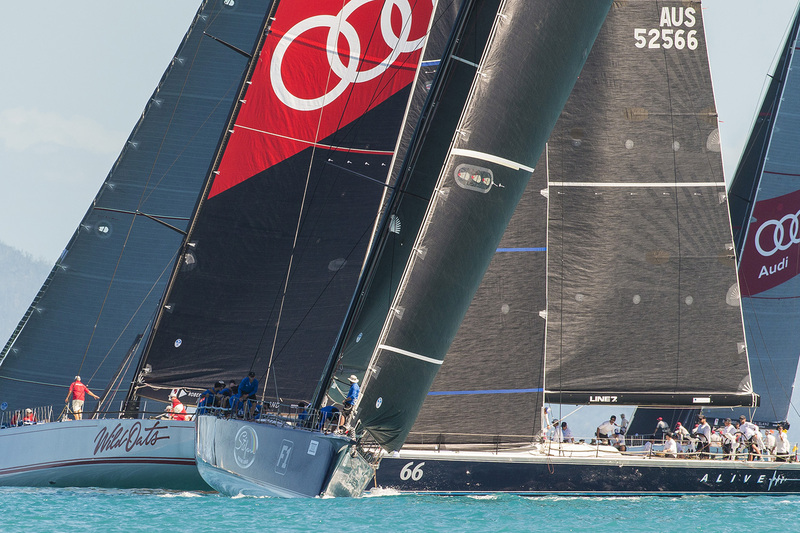 Four hours after the original scheduled start and with the entire Audi Hamilton Island Race Week fleet moved to open water on the south-western side of the island, the first start on day three got underway near Surprise Rock in a light south-east breeze. The IRC Racing fleet led off, Peter Harburg’s Black Jack 100 in control of the small but potent division from the outset, and rolling starts every five minutes saw the remaining divisions set off on their scenic island course. 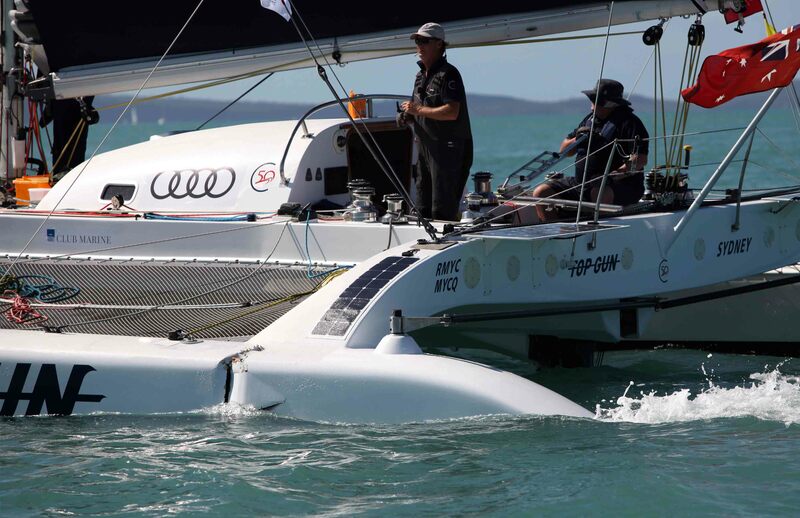 In light winds and perfect Whitsunday winter sunshine an incident seemed unlikely, but two boats in the Multihull Racing division managed a port-starboard incident off Ann Island that holed Darren Drew’s Sydney based Crowther 50 Top Gun. With a nasty crack in the port hull and taking on water, they lowered sails, started the engine and headed for Hamilton Island with the other multihull involved, Drew Carruthers’ Rushour, escorting them. Some hours later back at the marina Top Gun’s crew was still trying to stop water entering the damaged hull using tape and buoyancy aids. They will use Wednesday’s lay-day for repairs in the hope of returning to Thursday or Friday. HRH Prince Frederik of Denmark on NANOQ. On their second line honours win from three starts Black Jack’s tactician Tom Slingsby, part of Team ORACLE USA America’s Cup who lost to the Kiwis in Bermuda in June, said: “It was a bit of a drag race at times; we got the better start and we were able to control them and in the end we sailed away to a pretty convincing win. 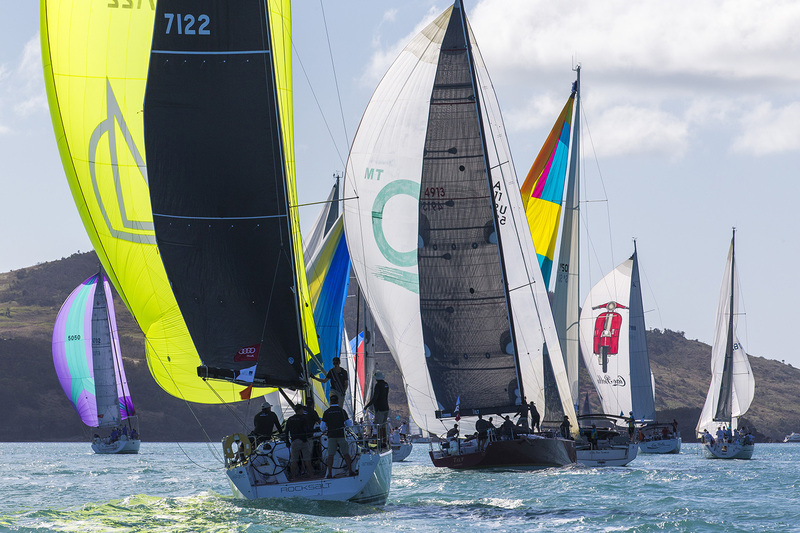 Audi Race Week is the second in a series of match-ups between the two 100-footers leading into the ultimate endurance contest, the Rolex Sydney Hobart Yacht Race. Looking forward to December Slingsby added, “In the stronger conditions you can’t match Comanche and you can’t match Wild Oats XI so you’ve got to have your sweet spot. 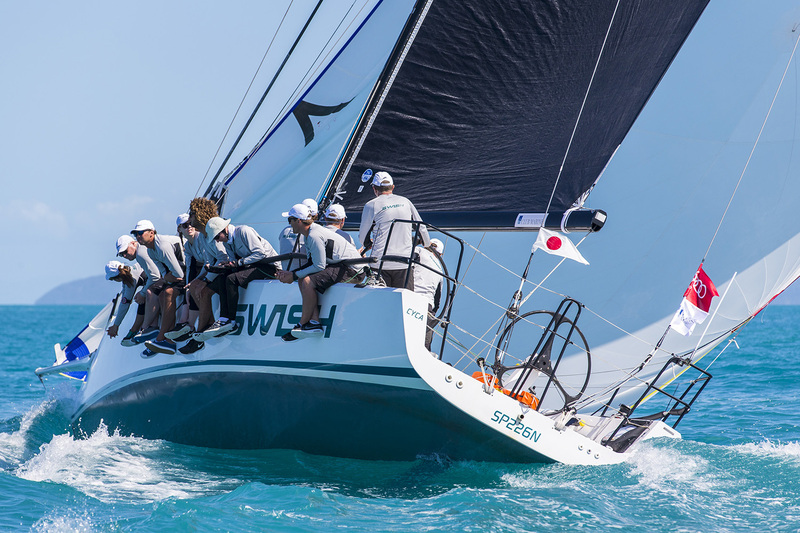 Phil Turner’s RP66 Alive leads the IRC series on handicap and Brent Fowler’s TP52 M3 is second overall after Tuesday’s corrected time win in their islands race. Alive’s tactician Tim Somerville said, “I put it down to good crew work, the guys are scrambling really well and we are getting a bit lucky. At the midway point in the series, IRC Passage division 1 is in the grip of Steven Proud’ s team on his Kernan 44 called Swish. 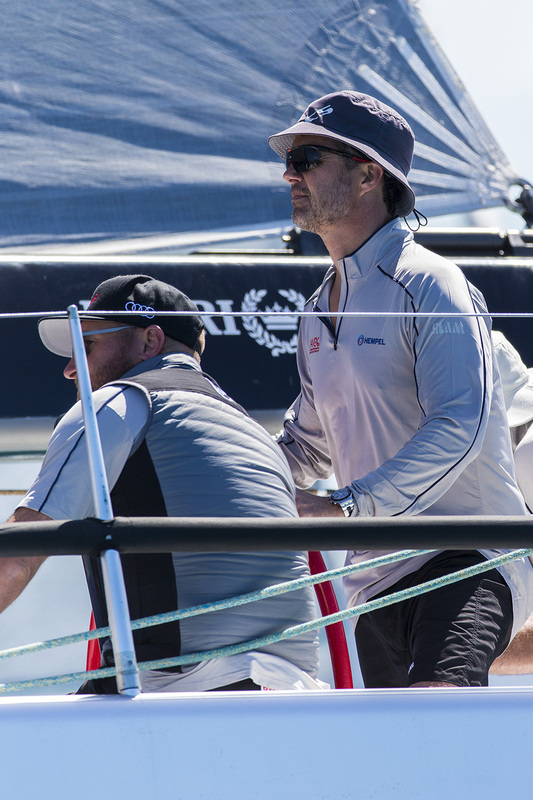 In division 2, Ray Roberts’ hand-picked crew, including Ben Lamb from the Softbank Team Japan AC team, on his Sydney 38 Team Hollywood are ahead by seven points thanks to 1,3,1 results. Matt Brooks’ timber classic Dorade is running second in that division. 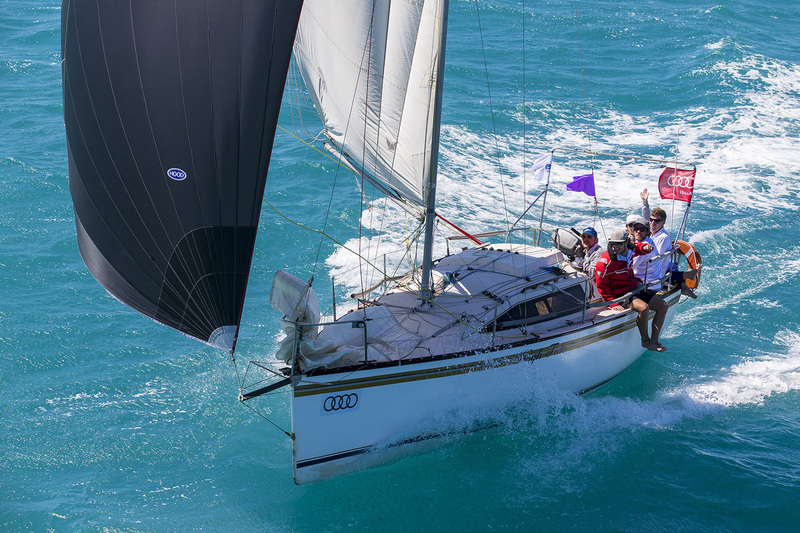 Anthony Coleman’s J133 Euphoria from Sydney won at Race Week in 2011 and so far they are on track to repeat the success in the Racer/Cruiser division with 1,4,1 scores. Points are tight in the Trailable division, Shannon Hart’s Ross 7.8 High Tide sailing for Queensland just one point in front of Anthony Passmore’s Melges 24 Planit from Sydney. Wednesday is the layday at Race Week and the weather is looking great for a day at the world famous Whitehaven Beach, the Piper-Heidsieck lunch at qualia and Beachside Pool Party at the main pool throughout the afternoon. Thursday’s forecast is steering towards a similar day to Tuesday before the tradewinds make a return, potentially 10 to 15 knots on Friday and 15 to 20 knots on Saturday to tidy up the 34th edition of Race Week.